You work hard to design and build an efficient wire harness for your heavy-duty equipment. It only makes sense to work just as hard to protect it from the working environment so it functions properly over the life of the machine. It begs the question: how can you protect something that can be so complex? 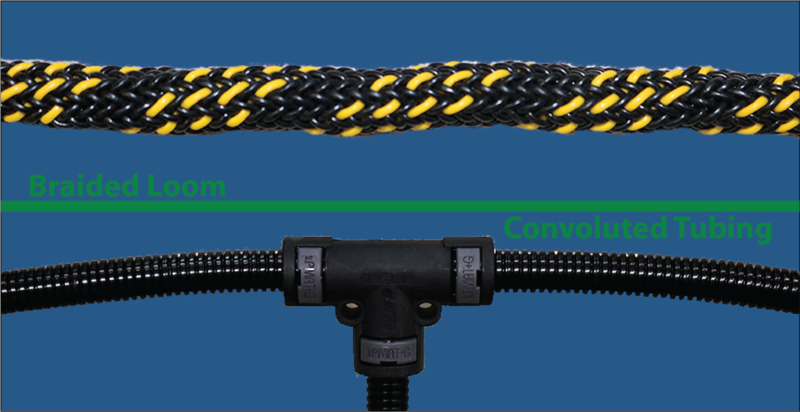 There are several viable answers to that question, but for simplicity’s sake let’s briefly compare two of the most popular wire harness protection choices: braided loom and convoluted tubing. Sending the wire harness through a looming machine wraps it with braided PVC-coated nylon that provides flexible protection from heat and vibration in a variety of heat resistance ratings. Copper loom options are available to further safeguard the harness from electromagnetic interference. Braided loom also allows water to pass through, which is particularly important if the machine will be exposed to freezing conditions. Since the nylon is braided directly onto the wire harness, it’s one piece with a clean look that’s free of extra tape or zip ties. Further, the PVC-coated nylon comes in a wide range of colors that can enhance aesthetics or differentiate your brand. If you prefer using black nylon, you can choose “tracers,” which are different colored strands woven into the braid. Tracers can be used to tell the OEM which supplier partner built the wire harness or which control system the harness operates. Looming does have some drawbacks. Beforehand, you’ll need to make sure the wires are taped together neatly with the different branches clearly separated. Looming also requires a machine that can accommodate the size of the wire harness, and it can be labor intensive. Workers need be aware of the potential for added shoulder, neck and back strain, and should take a break every 20 minutes. The machinery is also loud, so operators should wear hearing protection at all times. Convoluted tubing comes in various plastics with different heat and chemical ratings. The tubing is liquid tight and will accommodate many different of connector backshells. There are also many fittings available for different harness branch configurations that will maintain the liquid tight seal. Convoluted tubing comes in a wide variety of diameters, all of which allow the wire harness to be flexible, and colored tubing is available to fit aesthetics and/or branding. The major setback to convoluted tubing is that you’ll have to fish the wire harness through the tubing and any necessary fittings. This can be very difficult for complex wire harnesses. If you don’t use fittings at branch intersections, you’ll need to use electrical tape or zip ties to secure the tubing, as each branch requires separate pieces of tubing. This can affect the liquid tight seal. And, much like braided loom, you’ll need to make sure the wires are taped together neatly with different branches clearly separated before attempting to fish the harness through the tubing. Both braided loom and convoluted tubing can be ordered with a split. This allows for easier application on the harness, but zip ties or tape are then required to secure the protection to the wire harness, which will allow liquids to flow through. As for which option is best for your application, several factors must be considered. If you have a very large wire harness, the braided loom will likely be the most efficient way to protect it instead of trying to fish everything through the tubing. However, if you have a smaller harness that needs to be liquid tight or chemical resistant, convoluted tubing is the way to go. Helping customers make these types of decisions is something we do regularly at MCL. Learn more about how we go the extra mile for our customers by reading How MCL Minimized A Customer’s Production Delays. Click the button below to download the case study.